Which MacBook to Buy, and When? "'I just wanted to drop a quick line out there to give a heads up on a problem I have been seeing more and more frequently at the CDB Data Recovery Center. "I have been noticing that the Seagate Momentus 5400.2 SATA laptop drives from MacBooks (60 GB and up) have been coming in with failures. These hard drive failures are quite severe. When I send these drives out to the facility <<name deleted but *very* well known>> that handles our heavy damage / invasive data recoveries, they are unable to get any data from the drives as well." "I am beginning to think that the iPhone euphoria has finally gotten to some bloggers out there because I keep reading ridiculous stories about Apple and their fabled UMPC (that's Ultra Mobile Personal Computer for those of you who are acronymly-challenged). Both CNet and AppleInsider are convinced that we are mere months away from seeing the first glimpse of this device. Why suddenly people think that a useless product with fundamental flaws and no real market can succeed if only Apple makes it is beyond me. Guess what? Apple won't be making an 'OS X Tablet' or a 'New & Improved Newton' anytime soon, so stop battling the forces of reality and just accept that fact." "While both the MacBook and MacBook Pros are good systems, you get more RAM and larger hard drives on the MacBook Pros. The latest MacBook Pros hold up to 4 GB RAM and have more memory on their video cards as well. The MacBook Pro is definitely the way to go if you need maximum memory and storage. The smaller MacBook Pro has a 15-inch screen, so it is not as petite as the MacBook or the older 12-inch PowerBook G4, but you have to make a trade-off between memory and video capacity on the one hand and small form factor on the other." Link: Which MacBook to Buy, and When? "Apple's budget laptop range contains much the same technology as its pricier Pro brethren and the neat plastic chassis shows few obvious signs of corner cutting. The 13.3in screen is compact but bright, clear and colourful. The large keys proved capable and the battery lasted 5 hr 34 min. Its Intel Core 2 Duo processor handled the Apple software well and it can also run Windows, though that must be bought separately. The MacBook weighs just 2.3 kg but its value is eroded by a skimpy 80 GB hard drive, only 1 GB of RAM and no DVD writer on the model as tested. The older iPod-white style case is overdue a redesign too." "I got stung by my last MacBook Pro review which went to press before the unit started showing problems with build quality and durability. I would not have pronounced it so with confidence any sooner than this, but I can state now that today's MacBook Pro stands head and shoulders above Apple's prior flagship Intel notebooks, and sets a standard for performance, features, durability, eco-responsibility and quality that any PC vendor will find difficult to approach for a similar price. "The Santa Rosa MacBook Pro (named for the Intel Core 2 Duo chipset used in the notebook), perhaps also known as the LED backlit MacBook Pro, has earned its stripes. If this notebook had a frequent flier account of its own, it would have racked up enough travel miles in my carry-on bag to qualify for Gold status. I figure that this is a fitting milestone for writing this machine up, because by this point, most notebooks, including some from Apple, would be showing their age. This machine looks, feels and runs like it did when it came out of the box. Considering how sweet it was new, that's saying something. "Apple has transcended PC notebooks. The Santa Rosa MacBook Pro doesn't look or feel like any notebook you've ever driven, even if your present notebook is a Mac. It's built." The improvement would let both desktop replacement systems and thin-and-light notebooks produce more uniform colors, save power, and reduce their thickness compared to traditional displays with cold-cathode fluorescent (CCFL) backlights. PR: Blast past the limitations of USB 2.0 based ExpressCard adapters! 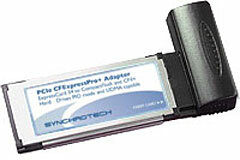 Synchrotech's CFExpressPro+ PCIe ExpressCard to Compact Flash adapter is based on the 2.5 Gbps PCIe portion of the ExpressCard standard. Designed for ExpressCard 34 and 54 slots, the CFExpressPro+ PCIe ExpressCard to Compact Flash adapter allows fast and reliable access to data stored on Compact Flash memory media cards. Perfect for digital photographers and other users of Compact Flash memory cards, the CFExpressPro+ PCIe ExpressCard to Compact Flash adapter allows for fast access to Compact Flash contents at speeds comparable to FireWire 800 devices, and much, much faster than USB 2.0 based devices. Light and compact, the CFExpressPro+ PCIe ExpressCard to Compact Flash adapter slides into a ExpressCard 34 or 54 slot on notebooks, MacBook Pros, and specially equipped desktop computers. The CFExpressPro+ ExpressCard to Compact Flash Adapter supports PIO and UDMA, meaning it takes full advantage of speeds with newer UDMA 4 Compact Flash Cards like SanDisk Extreme IV. At 25 grams, the adapter is lightweight and easily stores for traveling. 14" laptop bag]Lightweight, compact and highly mobile, the Viro is designed to hold small widescreen laptops such as the Apple MacBook 13" and 14.1" PCs perfectly. Laptop Compartment 13.5" x 10.5" x 1.25"
External Dims 14.5" x 12.0" x 4.5"
15" laptop bag]Redesigned for 2008, the Endo is designed to hold mid-sized widescreen laptops such as the Apple MacBook 15" and 15.4" PCs perfectly. Laptop Compartment 14.5" x 10.5" x 1.5"
External Dims 16.0" x 12.0" x 5.0"
17" laptop bag]All new for 2008, the Mojo is designed to hold large widescreen laptops such as the Apple MacBook 17" and 17" PCs perfectly. Laptop Compartment 15.75" x 11.5" x 2.0"
External Dims 17.5" x 13.0" x 6.0"
Note: The Mojo is the bag that replaced the Endo XL. PR: BackPackShield Manufacturing has announced a series of Level IIIA bullet resistant portable shields for student backpacks, computer bags, brief cases and other portable cases and bags. Impermeable to most handgun bullets, the shields are portable and can be moved between backpacks and bags, securing the investment and offering years of use. The patented bullet resistant Dupont Kevlar BackPackShield™ is a light weight armor panel insert manufactured with the most advanced and lightest aerospace ballistic composite material available. Manufactured with more than ten layers of bullet resistant Dupont Kevlar™ fabric, which has ten times the tensile strength of steel, the layers are bound and epoxy impregnated into a sheet less than 1Ú2" thick and weighing less than a typical textbook. Retailing for $249, for a standard size which fits most student backpacks, the shields are available in more than 10 colors to allow discretion, or personalization. The BackPackShields come with an installation kit with removable Velcrowhich allows easy removal, washing, and portability. "Unlike weaker level II ballistic curtains that are permanently sewn into bags, BackPackShields are manufactured to a much higher National Institute of Justice (N.I.J.) Level IIIA specification," said Kerry Clark, President of BackPackShield and defense contractor and supplier AMPTEC RESEARCH Corp. "Level IIIA protection specifications can stop even the hardened full metal jacketed high velocity handgun bullets including 9 mm and 44 Magnum that pass right through a level II bulletproof liner." BackPackShield manufacturing, located in Austin, TX, was founded by Kerry Clark. Clark is also the President of defense and aerospace supplier Amptec Research Corp. Clark has more than 27 years of experience in developing and designing explosive safety products for safely testing high explosive ordnance such as missile warheads for the USAF, US Navy, Lockheed Martin and Boeing Company. Inspired while working with the USAF Special Operations, who were lining their MH-53J PAVLOW Attack Helicopters with bullet resistant Kevlar™, Clark realized that a light thin semi-rigid backpack shield that stops virtually every handgun round could be discretely added to student and collegiate backpacks, providing both protection and peace of mind for students and families.